Who would have thought an innocent cake could cause so much trouble? It all started when The Husband innocently suggested he would make a cake to take into work, like he has done many times before. Except he forgot that this day was stock take, which involves 25 people, more than twice the usual cake-consumers. One cake was never going to be enough. What he didn't realise was, when you increase the volume of cake, the potential for disaster increases too. 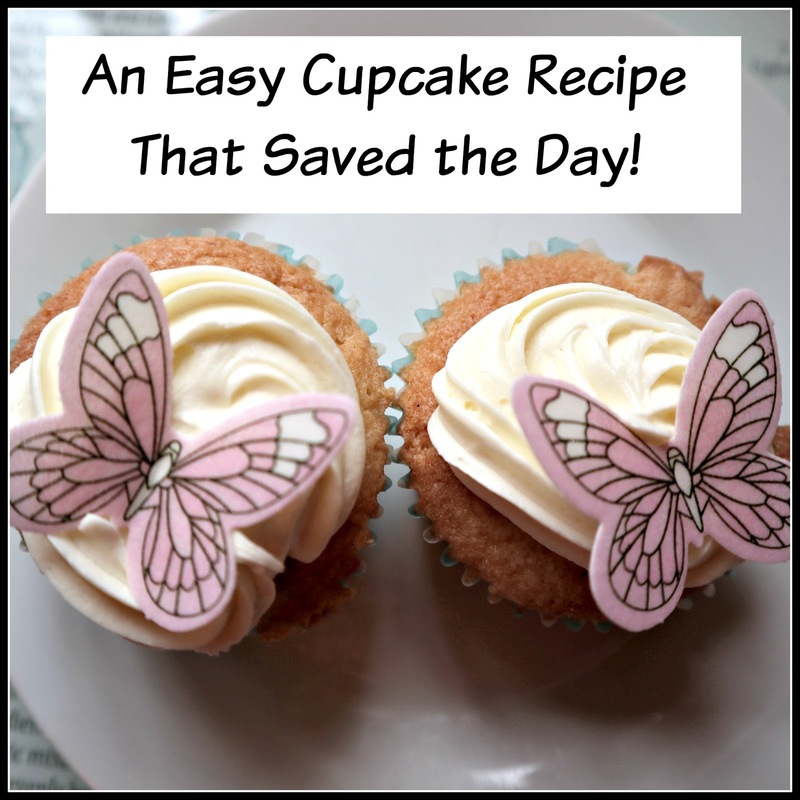 Here's what happened next, and how a decent fool-proof cupcake recipe can always put things right. Save this one for when you need your cakes to turn out right the first time! At the weekend we go swimming, which gave The Husband plenty of time to get his bake on. 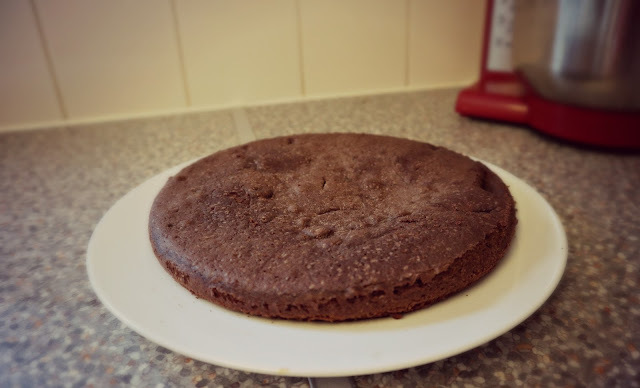 He was not anticipating any problems, as this was a sponge cake he had made before. It was me who taught him to make it, actually, but that was a very long time ago. When we got home from swimming, this was what we found. Baking disaster number one. He was pretty sad at this outcome. Making cakes takes time and effort, so it's no fun when they rebel on you and refuse to rise. This one just hadn't risen at all. I had my suspicions and asked him if he'd remembered to fold in the flour. Since we got our Bosch Stand Mixer, it was very easy to throw everything in and forget that, if you want something to rise, it's best not to beat all the air out of it. So we made another layer together, folding in the flour like pros. 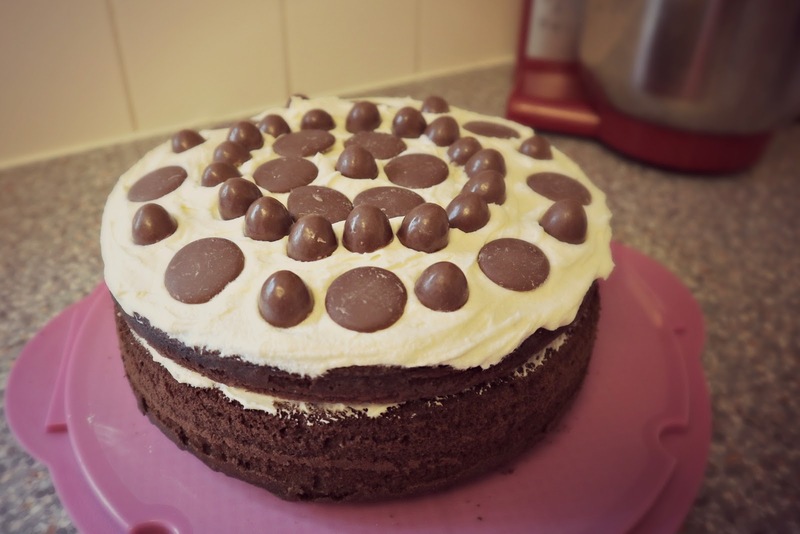 In the end it didn't turn out too shabby, and he enjoyed decorating it with Kinder Choco-Bons and Cadbury Giant Buttons. 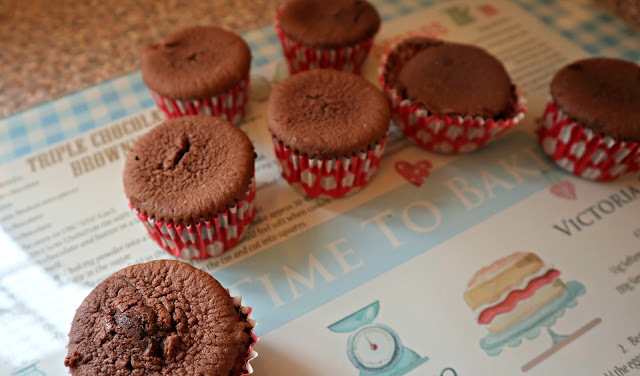 Disaster averted, I thought, and continued with the Saturday afternoon film, leaving him to carry on with the cupcakes, with his new found flour folding technique. He would be fine, right? 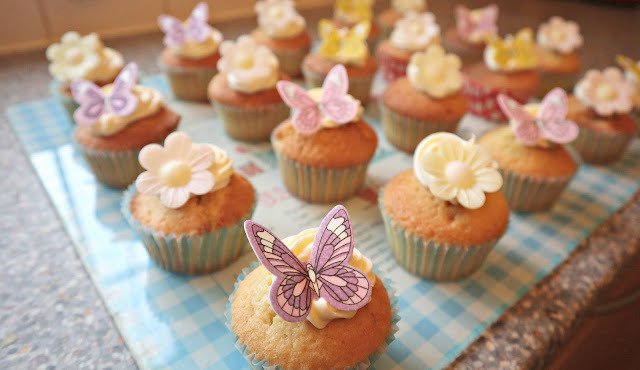 Cupcakes can't go wrong, can they? Apparently they can. We may never know how this happened, he followed all the instructions, even remembered to stick a sharp knife in to check they were cooked all the way through. When they came out of the oven, they looked absolutely fine, until, five minutes later, this happened. The Husband was devastated. He felt betrayed. How could a simple cupcake let him down and in such a cruel way? Sitting there, all perfect and fluffy then, as soon as his back is turned *pffftttt* letting all their air out like that? Harsh. Looking at his sad, dejected face, there was nothing else for it, it was time to put my pants on the outside, and step in to save the day. I was a little nervous, maybe the baking gods would be gunning for me too, but I had to try. First a trip to the supermarket for more ingredients, then I got to work with my favourite and, thus far, fool proof cupcake recipe. I mixed everything together really carefully and it was an anxious wait for them to cook. Was it long enough? Would they sink too? I really didn't want to have to go back to the supermarket a third time, at this rate it would have been cheaper to get a delivery from Krispy Kreme. It was a nervous wait, as we both stared at the perfect fluffy peaks, waiting for signs of sinkage, but they stayed put! All that was left was to ice them and he could go to work, pride intact, yippee. What began as a quick half-hour job, somehow turned into an all day baking exercise which took no less than 19 eggs and a kilo each of flour, caster sugar and margarine to get right. 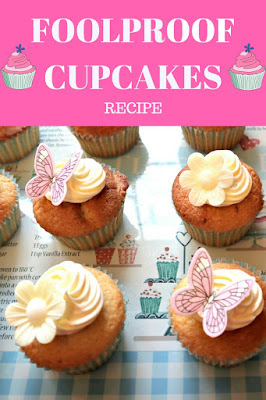 To avoid this happening to you, here is my foolproof cupcake recipe, which hasn't let me down yet. Just don't forget the folding! This came at just the right time as we have the school bake sale this Friday so I'll be using this! Ah bless him!! 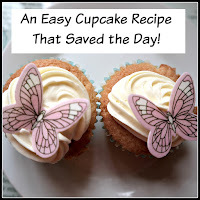 The cake looked really yummy in the end and your cupcake recipe worked a treat. I am not sure my hubby would ever bake for work or otherwwise! Oh they are so pretty! I'm a terrible baker though! Oh the baking is my domain in this house! He makes fantastic dinners though! Lovely looking end results!